Chole recipe with step by step photos. Absolutely delicious and easy to make tried and tested punjabi chole recipe with step wise pictures. Spicy, tangy and tasty punjabi chole masala with well complimenting flavors just like you get in street side shops. 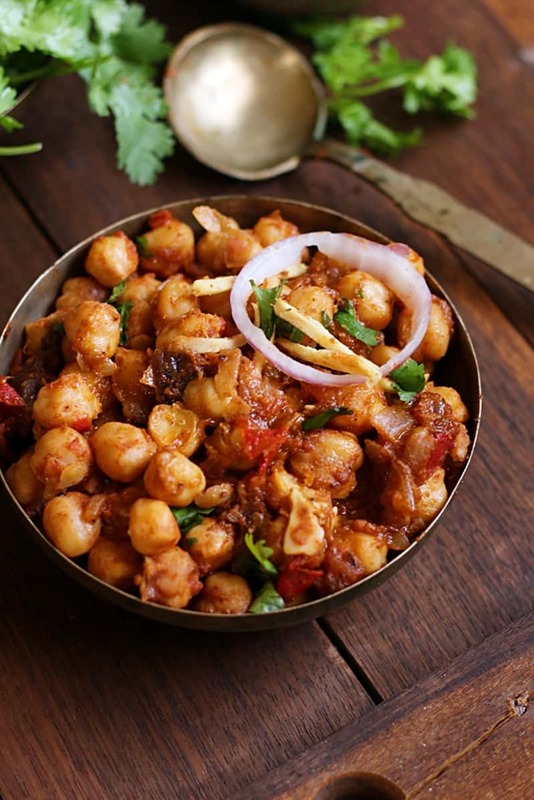 Punjbai chole masala is a delicious combination with bhatura, kulcha, poori etc. 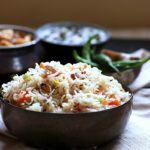 Chole masala is our favorite and I make it often as it is healthy too. Making chole masala is very easy if you have chole masala powder handy. You can make your own chole masla powder and store it for quiet sometime. If there is no homemade chole masala powder, you can use a good store bought one. To get a slight dark colored chole, usually tea bags or dried amla is added while cooking chickpeas. You can add or leave it as per your preference. I have not added any here. Once you have chopped tomatoes and onions ready, this chole gets ready in 20 minutes flat. Serve Punjabi chole piping hot with bhatura, poori, tandoori roti etc. 1. Soak dried chickpeas in enough water for 8-10 hours. 2.Drain and pressure cook the chickpeas until well cooked. You can add few teasbags or -4 dried amla while pressure cooking. Also add required salt. Once the pressure is released set aside the cooked chickpeas and reserve 1/2 cup of the chickpeas cooking water. 3. Heat 2 tablespoons in a pan. Temper with 1/2 teaspoon cumin seeds. Add finely chopped ginger garlic, slit green chilies and saute well. 4. Add finely chopped onion and mix well. Saute and cook till onion turns soft. 5. Add chopped tomatoes and mix well. Add salt, turmeric powder, chole masala powder and mix well. Cook till the tomatoes turn mushy and leave out oil from the sides. 6. Add the cooked chickpeas and mix well. Add the reserved water and mix well. Cook in medium flame for 8-10 minutes. Garnish with cilantro leaves and stir in the lemon juice. While serving you can add onion rings, very finely chopped ginger. Serve punjabi chole hot with roti or bhatura. Punjabi chole recipe with step by step photos. Restaurant style chole masala made easily at hoe with pantry staples in 20 minutes! Soak dried chickpeas in enough water for 8-10 hours. Drain and pressure cook the chickpeas until well cooked. You can add few teasbags or -4 dried amla while pressure cooking. Also add required salt. Once the pressure is released set aside the cooked chickpeas and reserve 1/2 cup of the chickpeas cooking water. Heat 2 tablespoons in a pan. Temper with 1/2 teaspoon cumin seeds. Add finely chopped ginger garlic, slit green chilies and saute well. Add finely chopped onion and mix well. Saute and cook till onion turns soft. Add chopped tomatoes and mix well. Add salt, turmeric powder, chole masala powder and mix well. Cook till the tomatoes turn mushy and leave out oil from the sides. 2. You can leave out teabags or dried amla if you wish. Thank you for this perfect chole recipe Harini. I make this very often these days.